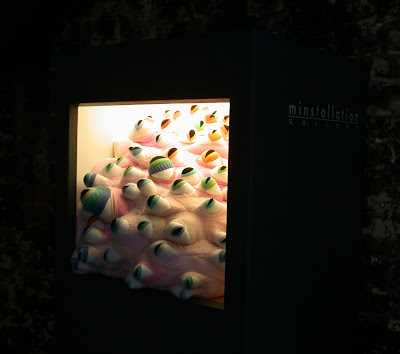 Please join us this Thursday evening to celebrate the opening of "Eyepiece," a new minstallation by Jennifer Strunge. An indisputable phenomeon the DIY art/craft scene, Jennifer Strunge’s goofy, stuffed Cotton Monsters are instantly recognizable and have been shipped throughout the world. With Eyepiece, her creatures inhabit the space like a dark corner of your imagination, peering back out at you. A Baltimore native and practicing artist and puppeteer since preschool, Strunge’s work begs to be touched and doesn’t take itself too seriously. 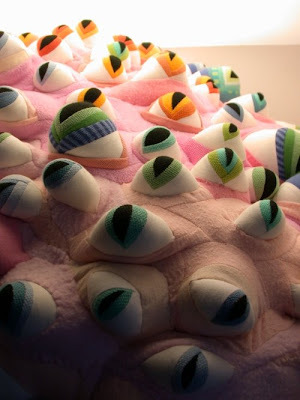 She works almost exclusively with recycled cloth, giving old clothes, blankets, and linens an entirely new life as they are reconstructed into comforting (if bizarre) quilts, monsters and soft sculptures. The reception is Thursday, November 6 from 6 PM - 8 PM. Eyepiece will be on view until December 20.